NYLPI gathered with our Transform-Don’t-Trash Coalition allies outside city hall today, including Council Member Antonio Reynoso and members of Teamsters Local 813, to support new legislation that would prevent sham unions from exploiting vulnerable workers in New York. The New York Daily News covered afternoon’s events here. The legislation follows the use of a sham union by Sanitation Salvage, the disgraced company shut down last November after worker deaths, to prevent workers getting proper union representation. Melissa testified in support of the legislation, and you can read her full testimony here. Pedro Garcia, a 21-year-old former Sanitation Salvage employee, said, “The union voted on a contract that they didn’t even consult with us on. When I asked them why they did that, he said right to my face, ‘We came up with a contract that benefits the employer,’ and I said, ‘I thought you were supposed to represent us’”. Reynoso said, “Sham unions negotiate with the employers about what they’re going to give to the workers, and the workers don’t even know they belong to a union. They don’t think that there’s anyone out there to protect them”. By not being represented by a real union, many Sanitation Salvage workers were subject to conditions like not getting workers compensation, no job security, no gear provided, no health insurance, and exploitation of labor. Many of the workers testified that they spent more time working on the truck than they did with their own families. Manuel Matiras, a former Sanitation Salvage worker, said: “The starting salary was $65/night for 1,500 stops. It wouldn’t matter if it took you five or 15 hours. You just had to get the work done”. Several workers made similar statements about exploitation of labor. Many council members expressed the same interest in a need for a bill that would halt the growth of sham unions and protect workers rights. 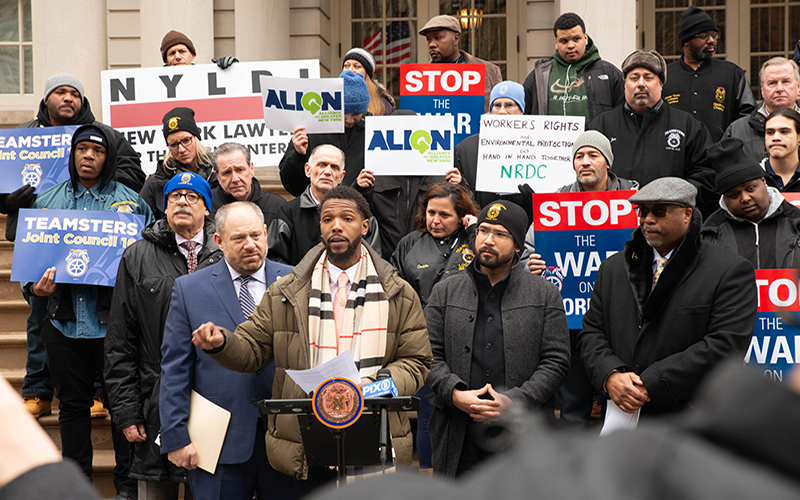 Council Member Jumaane Williams said: “In an industry where workers’ rights abuses are widespread and issues such as wage theft are all too common, we in the city need to take a stand and enact protections for people who undertake this difficult work for our city”. The conference ended with the workers chanting in unison, “When workers fight, workers win!”.